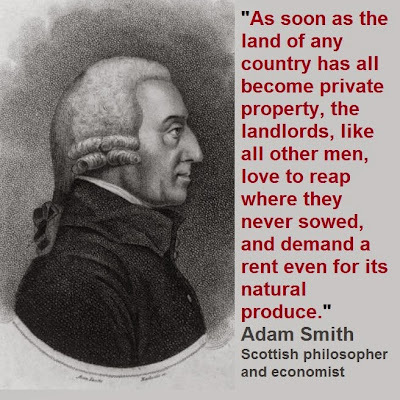 Adam Smith is often presented by the right as an idol of free-market capitalism, however Smith was never a free-market fundamentalist, as this quote shows. Like many other thinkers ahead of his time, his work was in turn mis-understood, mis-used and manipulated by the interests of those who wanted to push a particular agenda. Although we're not proposing he's a radical (he was an product of his class and era, like anyone else), we just invite you to always look to original sources wherever possible, to question the beliefs our culture is based on. but something more than in that proportion"
a badge, not of slavery, but of liberty." Smith was also an advocate of infant industry protection (and subsidisation) and of import tariffs to support local industry, things that the seething free marketeers have spent the last half century eradicating through the IMF, World Bank and WTO.